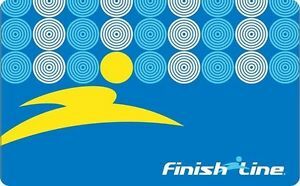 If sports are your thing, then a Finish Line gift card at a discounted price is a sure win! Whether you’re looking for running shoes or sandals, they have all you want and more, so let the savings begin! You can shop shoes, apparel, accessories and featured products while saving money! With 660 stores conveniently located in malls throughout the United States, finding a store is nearly as easy as shopping for your next great sneakers! And just think of the money you’ll save when you purchase your Finish Line gift card from Cards2Cash! Who knows, maybe you’ll have another money to buy that jersey you’ve had your eye on, or an extra pair of basketball shoes to help you demonstrate your moves on the court! A Finish Line gift card will give you the best value for your dollar. And with departments in men, women, new arrivals, kids, sale, fan gear, and brands you will find the shoes you need and more! And that’s not all; they have the name brands you love! With Cards2Cash you can save money on Adidas, Alala, Asics, Jordan, Mizuno, Neff, New Balance, and more! Buy a Finish Line gift card today and save money on your entire purchase! But the savings don’t end there! Cards2Cash offers a variety of discounted gift cards for everything from shoe stores to pet stops. Check out our listings for Nike, Foot Locker, Addidas, and more! With Cards2Cash on your side, saving money is a sure shot! Do you have a Finish Line gift card you aren’t going to use? Cards2Cash will turn your unwanted gift card into money! We buy gift cards for a variety of stores, restaurants and Clothes shops! Visit one of our retail locations to receive money on the spot for your unwanted card OR fill out our online form, and we’ll make you an offer you won’t want to refuse! Whether you buy a gift card from Cards2Cash or sell us one, it’s a win-win situation!